October is National Cybersecurity Awareness Month, and Demarest’s frank warning was delivered to members of the Financial Services Roundtable (FSR) at an October 20 event focused on how the private sector and law enforcement could work together to combat hacking threats. Cybersecurity has emerged as a top challenge for both the private and public sectors. While news accounts abound of consumer retailers and financial services firms being targeted for cyberattacks, the reality is that virtually any connected entity is vulnerable to criminal hackers. In early October, for example, an attack on the Oregon Employment Department exposed the personal information of an estimated 851,000 state residents. Universities and hospitals have also been targeted for data breaches. FBI Director James Comey, in a recent 60 Minutes interview, emphasized that the number of cyberattacks on U.S. assets is too large to count—and that the motivations for hackers vary widely. An estimated 110 million Americans have had their personal data exposed in hacking incidents in the last year, according to the FSR. That’s half the adult population, and many individuals and businesses are unaware they may have been victimized. And while not every hacking incident results in the exposure of sensitive personal information like account information or Social Security numbers, more incidents mean heightened risk of sensitive data being exposed. When it comes to the theft of financial records alone, the numbers are staggering. The FBI estimates that some 519 million financial records—more than half a billion—have fallen into the hands of hackers in the last year. Moreover, it’s not just financial records and personal data at risk. Perhaps the fastest growth area in the realm of cybercrime is the theft of intellectual property, often driven by state actors around the world seeking access to U.S. trade secrets and commercial properties. Data breaches don’t come cheap. The Ponemon Institute’s 2014 Cost of Data Breach Study, published in May, finds that the average cost of a breach for a company is $3.5 million, a 15% increase over the previous year. What can be done to counter cyber threats? Those facts reflect the sobering truth that, while so much of our lives has moved online to the always connected world of the Internet, that connection has created new vulnerabilities and substantial costs. The Chamber published the free 56-page Internet Security Essentials for Business 2.0 guide for businesses to help improve their ability to counter a cyberthreat or to respond when attacked. 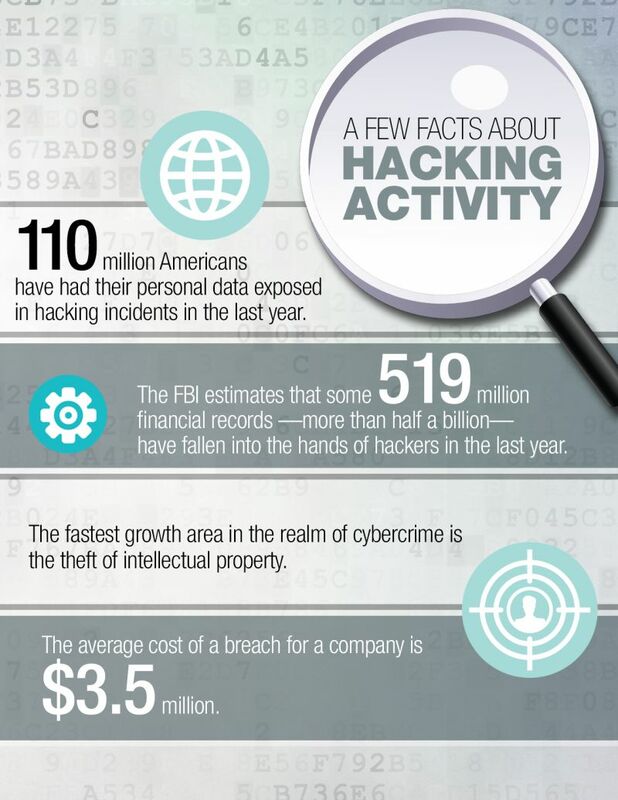 (For more resources on cybersecurity from the Chamber, government agencies and other expert organizations, click here). This year the Chamber has hosted a series of Cybersecurity Round Table events with state and local chambers to provide education about dealing with cyber threats. On October 28, the Chamber will host the Third Annual Cybersecurity Summit in Washington, D.C., to focus on how businesses can work to protect themselves against hacking threats, as well as possible public policy solutions to boost response and resiliency to cyberattacks. A constructive partnership between the private and public sectors will be necessary to counter cyberthreats, according to U.S. Chamber of Commerce President and CEO Thomas J. Donohue. Click here to register online for the U.S. Chamber of Commerce Third Annual Cybersecurity Summit.